There are eight positions in our Worship Associate program, giving each person an opportunity to present at approximately one service every two months. There are one and two-year commitments available, and if an Associate wishes to continue beyond two years, it is possible to reapply after one year has passed. This allows others to experience this unique relationship with the congregation. 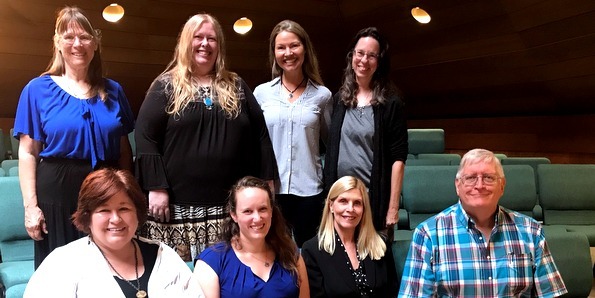 The Worship Associate is part of a worship team and each Associate works with support. Approximately one month prior to their chosen service, the Associate and Minister each contribute personal reflections and research. The Associate is responsible for writing significant portions of the Sunday service. During the second year, an Associate may be responsible for cooperatively creating an entire service for a guest speaker or giving the sermon. Those who are representative of the diversity of this congregation. Those who work well as a team because everything about worship is teamwork. Those who are excited about engaging in ongoing reflection and dialogue. Those who are interested in learning the dynamics of worship. Those who see worship as their spiritual practice. Those who want to practice seeing life through the lens of Unitarian Universalism. To Whom Are Associates Accountable? The Associates are most directly accountable to Senior Minister, Rev. Elizabeth Banks. Ultimately, they are accountable to the membership of the Davis congregation. The congregation is invited to direct comments concerning services to the Associates or to the Senior Minister. We are interested in learning through dialogue.